Manufacturer & Exporter of Abacus Books. 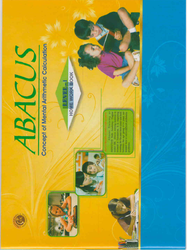 Our product range also comprises of Abacus Study Material and Abacus Bags. Banking on our skilled experts, we are involved in manufacturing, exporting and supplying an interesting range of Abacus Books with good quality and practice worksheets. These books are very useful to I-V Grade Students to develop their Mental Arithmetic. There are eight level books &each level having two books. In levels addition, subtraction, multiplication, division, percentage, LCM & GCD decimal arithmetic operations, square root, square, cube and cube root all are included.